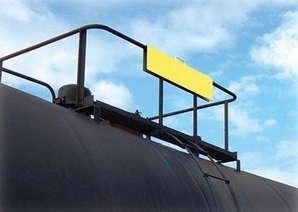 Close off unsafe tank car opening on rail cars. This Safety Gate fits over gap in railing at top tank car access ladder. The safety gates formed aluminum panel drops over railing ends. Its bright yellow finish makes it highly visible. � Size: 48" x 11".